Become a master of wild espionage and travel back in time to the era of the cold war in KGB Bears in this slot game. Crack the code with the help of these four beastly masters of Russian disguise and their unique gadgets allowing you to multiply your riches to unbelievable heights – a little tip off here and there doesn’t hurt either! Using a variety of features such as the KGB Bears crest and scattered cameras there is no lack of ways to play. Allow yourself to be engrossed by the exciting spy themed online slots while losing yourself in the backdrop of sSovietera Russia. Embrace your wild side and become a master code cracker today! Launched in 2012, “The Games Company” does not disappoint when it comes to an online slot and reel games. Based in the United Kingdom this fairly new company are by no means amateurs with many of their slots gaining a large amount of buzz throughout the world of slots. As a company offering an open platform to deliver and distribute exceptional content they truly are at the forefront of the industry. With many excitingly themed games such as two tribes, light racers and hippie chicks to keep you entertained you need not look any further for engaging, colourful and comedic fun from the comfort of your own home! Find out more about UK slot games and this developers' creations! 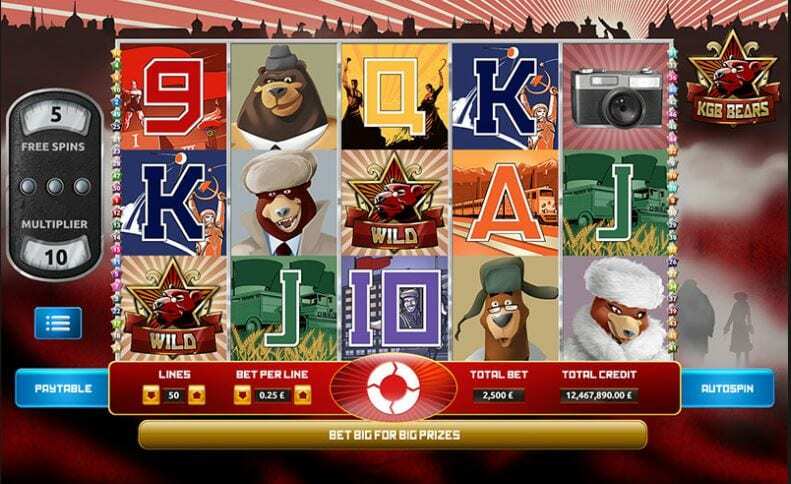 The exciting soviet inspired KGB Bears online slot game gives you 500 different ways to play thanks to its bet per line wagers ranging from 0.05 to 50 credits! Using a combination of the real-life backdrop of the cold war and the cuteness of cuddly bears this online slot game gives you an entertaining comedic experience. 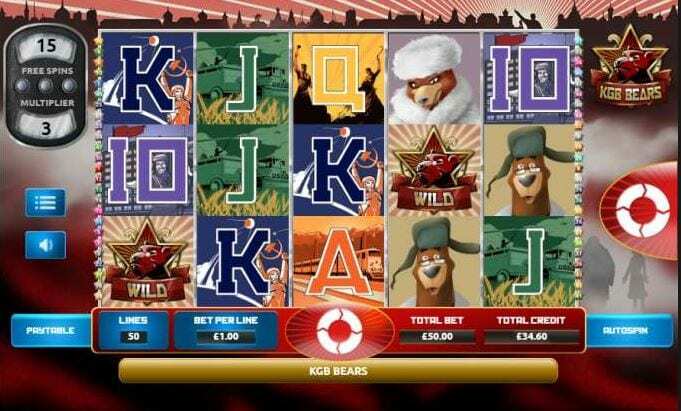 KGB Bears’ five reels and three rows give you more opportunities to win big not counting the wild tip-off which allows you to substitute it for any other card except the scattering camera which itself gives you free spins if three or more are in play! It's advisable that new players read our guide before they play the best new slots like this! The game features a heavy Soviet Russia theme with striking red and black imagery and industrial imagery on many of the games’ icons. The strikingly obvious disguised bears also lend themselves very well as a contrast to the overall soviet theme, giving us very funny animations from each bear as they are played from using an umbrella as a satellite to send transmissions, to utilising a self-building hang-glider to escape from danger! The variety of the imagery on the icons stay with the heavy soviet theme as they contain a number of cold war soviet Russia references such as the hammer and sickle, The Sputnik 1 satellite and multiple other agricultural and industrial images. Are you ready to become a master of espionage? Happy to live on the wild side? If so look no further than the wild ride that is KGB Bears online slot game. From the hilarious animations and imagery to the foreboding fanfare music KGB Bears is surely an adrenaline-fuelled adventure that will keep you coming back for more time and time again! If you enjoyed KGB Bears why not play Cosmic Reels?